Spending time in central Idaho this year, I witnessed what I conclude non-scientifically to be the direct result of global warming. 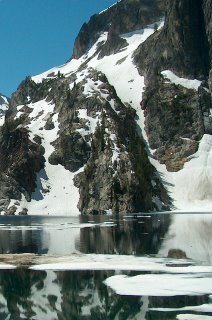 Since we were married in the area of Stanley Idaho, we travel there each year over the 4th of July. We have been doing this for 13 years now. Over this period we have often found that some of the higher trails are unaccessible due to snow. This has not been the case for the last 5 or 6 years. The central Idaho snowpack this winter was 125% of normal. This was a welcome change to the 40% of normal that we received last year. This is also higher than it has been for any of the years that we have been traveling there. With this in mind we were sure that we would have to stay at low elevations due to the snow. Once we got there we found out we were wrong. The high trails were accessible, the snow was gone. 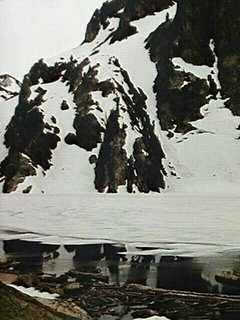 Here is an identical picture of Goat Lake, the first taken in 1997, and the second this year. Both taken on the July 4th weekend. There was obviously much less snow this year and the lake has thawed. I have searched for the specific snowpack for 1997 in this basin, but I haven't been able to find the data. I do know that this year's snowpack was higher based on all of the reports through the spring. I did find one chart from the USDA Natural Resource Conservation Service showing this year in the Salmon River basin compared with average and 1993 (near average). You can see here that the Salmon River basin was 25% above normal this year, yet all of the snow melted 1-2 weeks earlier than normal. While we might have had an exceptionally warm spring this year, it does appear to be a trend in this area over the past few years. This is the first time I have had specific photo evidence.